More than just a framework, the RR-Board® is a new way to work. Find out why you won’t be able to continue without using Runrun.it’s latest feature! RR-Board® is an innovative way for your team to visualize a project, displaying the totality of tasks (and which one) that make up each status of the project. It is a feature that unique to Runrun.it, not found elsewhere on the market. Despite being inspired by Kanban (developed by Toyota in the 1960s), the RR-Board® is a pioneering tool that translates the complexity of multiple teams into a framework that accurately reflects the priorities of people’s task requirements. 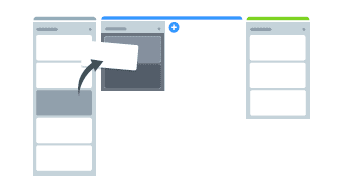 In other words, in the traditional Kanban method, the columns represent the project’s steps, while each task has its own card and each card is assigned to its responsible party. But while someone may be participating in more than one project at a time (as is often the case), this is not necessarily immediately obvious to their manager. And, as more and more people become involved in a higher number of projects, the complexity of the system increases exponentially, worsening predictions of delivery times, as individual team members’ workloads become more challenging to follow accurately. Here is a link to a video (in Portuguese) in which our client Fábio Ricotta, co-founder of Agência Mestre, a digital marketing agency, talks about the difficulties associated with using tools that were not designed with the complexity of numerous teams in mind. The RR-Board® offers realistic deadlines, since, when it comes to calculating the delivery time for a project, it factors in that person’s full task load. 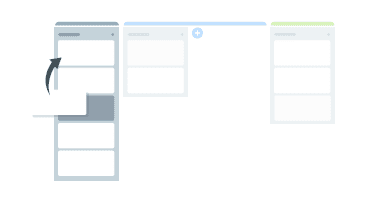 Each task has its own card, which shows who is responsible for it, the estimated delivery date and a progress bar. Each time someone moves a job from one column to another, the system recalculates the delivery estimate for the job according to its new position on the team member’s task list. When such a change occurs, its effect is not limited to changing the timing for the completion of the task. That change can affect the timing of innumerable other jobs and even other projects. All that is considered. RR-Board® factors in the reality that companies face: their employees are frequently involved in several projects at the same time, and in activities that aren’t linked to any specific project at all, such as weekly organizational tasks, for example. A task cannot be moved with its column. Why not? Sometimes the task that you wish to prioritize with a given column is not similarly prioritized in the responsible team member’s task list. What can you do about it? Enter that person’s task list and analyze their jobs. That employee is very likely to be simultaneously involved in several projects, and if you were able to reprioritize a specific task simply by dragging it to another column, you would be disregarding any priority that had been given to other clients and projects you may have been unaware of, thereby negatively affecting the company’s organizational chart, including other company deliverables. Switching to the RR-Board®, compared to the old kanban would be like changing from manual management to automatic management according to the complexity of your company. As a firm becomes more complex, it becomes more difficult to manage its priorities manually. The RR-Board® also comes complete with a new way to visualize projects. Different people work in different ways – and each person has their preferences. This new functionality considers this fact and gives your employees additional options for viewing their tasks. Runrun.it was built on agile principles and was designed to help your business to think in an agile manner. Reduce unnecessary overhead, formalize demands, deliver on a continuous basis, centralize communications, promote transparency and self-management in teams and companies. The RR-Board® is a powerful tool for bringing these benefits into your organization’s day-to-day. The default columns for this view are: Unassigned (Backlog), Assigned (Other Status), and Done (Delivered). The “Unassigned” column will list all the tasks within the project’s backlog (click here to find out more this feature). These are tasks that were assigned to a team but have not been allocated to a specific individual who would be responsible for the task. Here, Managers and Leaders can prioritize these tasks by moving the cards vertically. To assign the tasks in the backlog, simply drag that task to the desired column. Runrun.it will then calculate the task’s position within the new column based on the priorities of the responsible person. The “Assigned” column will contain a list of all tasks that have a status other than “Delivered.” Finally, the “Done” column contains the tasks that have already been completed and delivered by the person who was responsible for it. To deliver a task at any time, simply drag it to the last column. Instead of visualizing all the tasks within the “Other Status” column, you can choose which columns should be displayed on your screen. For example, in an editorial project, the chosen job statuses (and therefore the chosen columns) could be: Backlog > Topic > Awaiting client approval > Content production> Review > Done. Likewise, in an IT project: Backlog > In progress > Waiting for external approval > Pull Request > Test > Done. Obviously, as projects become more complex, they will have additional columns. 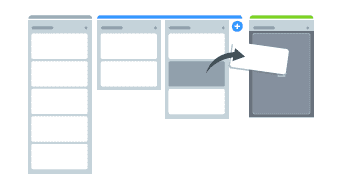 This way, you can track how many, and which, tasks are included in each step. Who can use the RR-Board®? The new functionality is available to Corporate customers and trial users. To learn more about our Corporate plan, including its resources and costs, click here.